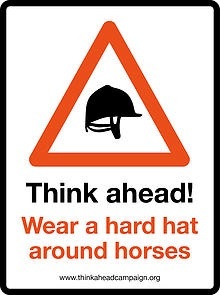 THINK AHEAD (http://www.thinkaheadcampaign.org/) was set up by Dr Jill Butterworth SEBC PTC BHSAI BVetMed MRCVS to support and encourage equine professionals, students and anyone who handles horses, to stay safe, be aware of the research and wear a safety helmet routinely. Another campaign has also been launched this week, with students at the Royal Agricultural University urging you to 'Crack The Hat' not your head. The campaign, which will benefit The Injured Jockeys Fund, reminds you to be aware of whether your hat is up to the current recommended standards.